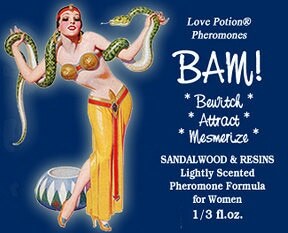 Bewitch, Attract, Mesmerize! BAM! Beta-Androstenol and a whopping dose of EoW Copulins, with a light cover scent. An ideal blend for sexual attraction, deep communication, comfort and bonding. Our BAM! varieties are full strength pheromone blends but only lightly scented...just enough fragrance to cover the scent of the pheromones. Also, being light, they are ideal for blending with complementary fragrances of your choice. 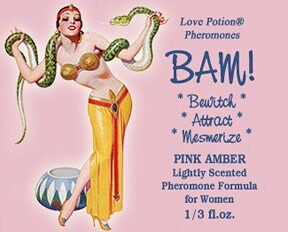 Contains 1,000 mcgs of pheromones per bottle. 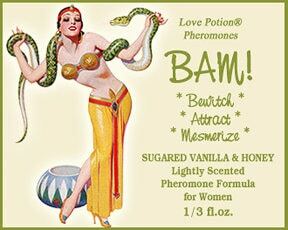 * SUGARED VANILLA & HONEY (Original Blend) ~ Ultra seductive - creamy vanilla and sensual honey. * PINK AMBER ~ Pinky sugars with a swirl of amber in the base. 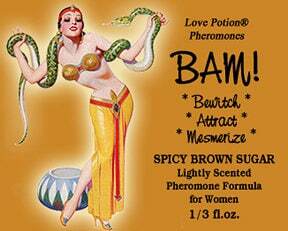 * SPICY BROWN SUGAR ~ Brown sugar with hints of cinnamon and amber.